Every Mediterranean culture seems to have some sort of treatment combining onion, eggplant and bell pepper. In France it’s called ratatouille. Others call it tapenade. In Spain, they serve a tapas dish made of roasted vegetables tossed with olive oil, thyme and parsley. I found a recipe calling for this aromatic mix to be spooned over slices of raw zucchini. What could possibly be simpler, tastier or more healthful? Making tapas is so much fun, I’m thinking our food appreciation classes might just linger here in Spain on our virtual world culinary tour. In fact, I’m beginning to get the idea that our spring parents dinner might just consist of a tapas bar. If that’s the case, we’re going to need a few more weeks to perfect our tapas making skills. There are so many different possibilities to choose from. My wife and I had such a great time recently in Barcelona exploring the local tapas bars. I think we can have fun with it in our cooking classes. This dish couldn’t be much simpler, but it does require quite a bit of vegetable prep work–the perfect thing to keep a group of kids busy. They love messing around with vegetable peelers and chopping things with real knives. 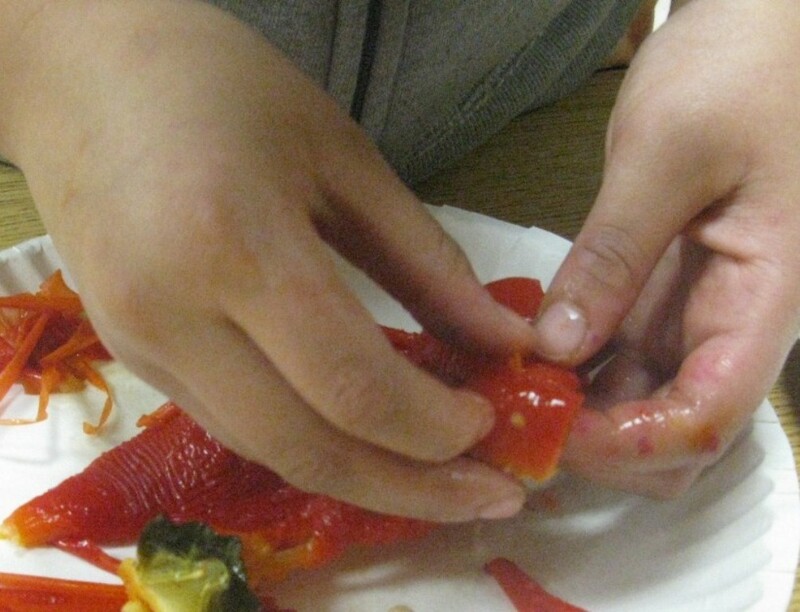 This recipe also involves peeling the skin off roasted bell peppers, something many of them had never experienced before. To make a generous, family-sized portion of these canapes, peel 1/2 of a small eggplant and cut it into 1/2-inch slices. Place these on a baking sheet lined with parchment paper. Follow with 1/2 red bell pepper, 1/2 green bell pepper and 1 medium onion, peeled, cut in half lengthwise, then sliced into 1/2-inch half-moons. Place in a 350-degree oven and roast about 60 minutes, or until the peppers are blistered, the onion is beginning to brown around the edges and the eggplant are cooked through. Remove the vegetables from the oven and set them aside to cool. Meanwhile, finely chop a small fistful of parsley leaves and remove the leaves from several stems of fresh thyme (or use about 1/4 teaspoon dried thyme). When the vegetables are cool enough to handle, chop them well, but not too fine. Place them in a bowl and stir in the parsley and thyme. Squeeze in about 1 tablespoon juice from a fresh lemon, then season with just enough extra-virgin olive oil to coat everything, some salt and freshly ground black pepper. Stir well to mix. To serve, cut a Zucchini on an angle into slices about 1/4-inch thick–perhaps a bit thinner, but thick enough to hold the roasted vegetables without collapsing. 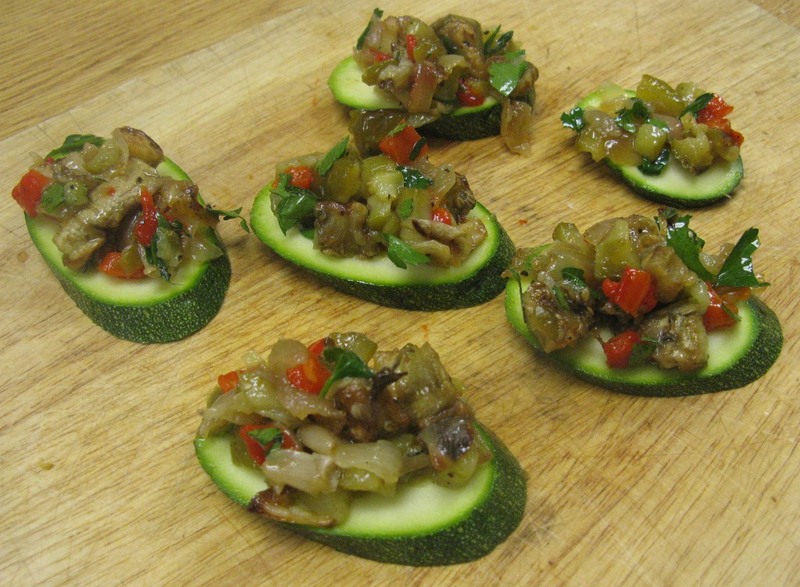 Then spoon the vegetables onto the zucchini slices and present them on a decorative platter. This is one way to get kids to eat their vegetables. I was surprised how much they liked it. You just never know what kids will go for. But I think these tapas are too beautiful to resist. In fact, in our “open enrollment” class where we get kids of all ages–and quite a large number of them–what we did was line the kids line up behind the bowl of vegetables, gave them a spoon and the sliced zucchini and let them make their own tapas. I’ve never seen such a patient, determined and focused group of kids around food. Most of them took two.